You know those fun graphic T’s you often find. The type that have random drawings on them, of old school coke products or goofy vintage? I will be the 1st to admit I like them :) – although sometimes they can be a bit over done. To me its always nice to have one or two in your closet to mix in with your wardrobe and they almost always work for men and women, boy/girl. Its just versatile and who doesn’t like a bit of art that pops. Well what if you took the artistic touch of some of those great T’s and put them to more use than some big national “brand.” How about using those T-shirts to help out a variety of charities but also spread the word about some great artist out there. The Yellow Bird Project is a Montreal-based organization. They work with an amazing range of indie rock musicians to create unique t-shirt designs that benefit an array of charities, each chosen by the musicians. I got one of their graphic hoodies and love it. It is super soft and comfortable. The pop of art on the front is very fun and unique as well. Very much a “Drea” piece. 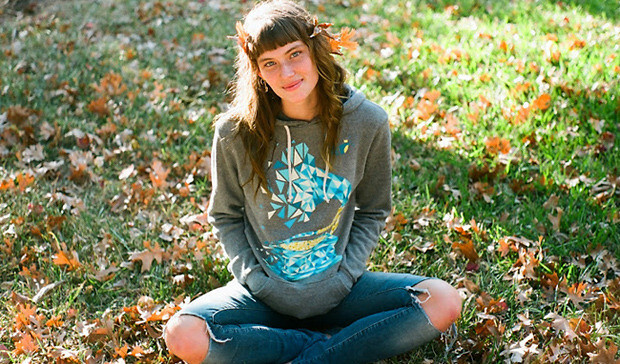 They offer not only a great variety of t-shirts but also hoodies, buttons, books and more. All of which support the charities. 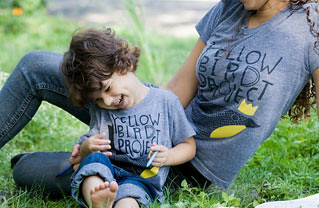 So if you are looking for a fun new T, yet want to do more than just “buy something” – check out the line of great t-shirts and more at the Yellow Bird Project. The Yellow Bird Project would like to give one of our readers the chance to win a “choice” shirt of their own as well as their fun button kit! You will need to fill out a simple form on the Yellow Bird website (will take you less than 5 minutes! – if you type as fast as I do it probably take you about 30 seconds.). Once you fill that form out, come back here and fill out the widget below. After you do that 1st step you will then be able to enter multiple times by liking them on facebook, twitter and so on. A winner from the U.S. will be chosen on 1/17/13 at 7PM CST. Please see our Giveaway Rules for further details. This post may contain an affiliate link or link to one of our regular sponsors. The relationship between our sponsors will never unduly influence the content of this post.